I am excited that my first book is now available in print! It took some planning, some writing and a whole lot of revising, but I finally have Acting: From First Audition to Final Bow finished. Well, as finished as a book ever gets. As has been pointed out before, an author never really finishes a book, he just moves on to the next one. Once I was done revising the book I had to format it for print. That was trickier than I thought it would be, but with much persistence I got it done. 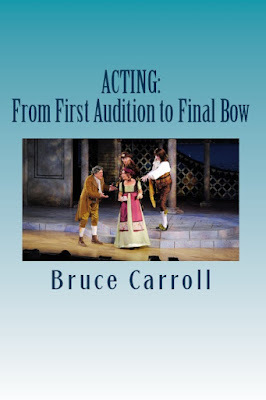 If you or anyone you know would like to learn about acting, you can purchase the book HERE. Of course, you can still get the digital version in a variety of formats HERE. You decide what you want to pay for the digital version! Congrats on getting the print edition done! It's funny you mention the publishing thing, because it feels to me like if you're an indie author that wants to provide the most worthwhile product for readers, you kind of have to learn the publishing end as well. I guess that's why it's called self-publishing (which sounds delightfully simple, but to do it well is anything but).